These beer biscuits are a snap to prepare and bake. They take just 20 to 25 minutes from start to finish! The biscuits taste wonderful and they make a nice bread for just about any meal. Serve these beer biscuits with a hearty chili. 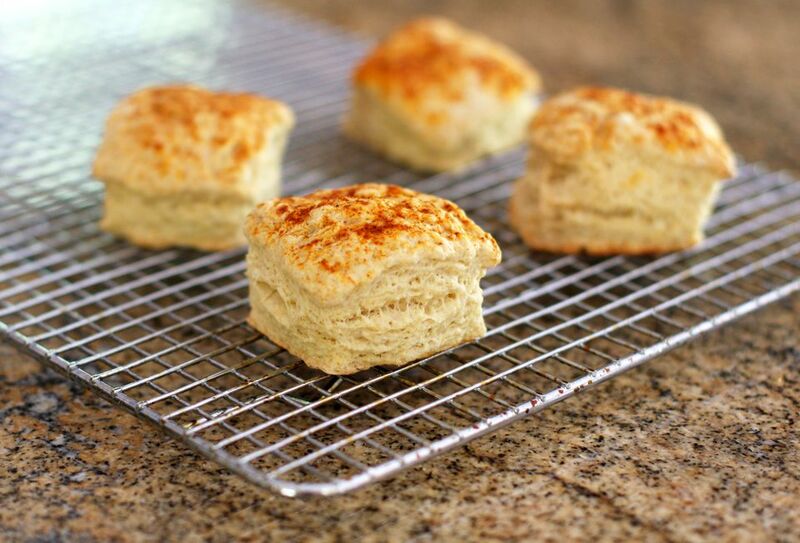 They're the perfect biscuit to take along to a tailgating event or party. Line a baking sheet with parchment paper or a silicone baking mat or spray lightly with baking spray. Combine the flour, baking powder, baking soda, salt, and sugar in a mixing bowl. Whisk to blend thoroughly. Add the melted butter and beer and stir until the mixture holds together. Turn out onto a floured surface and knead 3 or 4 times, just enough to make a soft, cohesive dough. Pat the soft dough into a circle about 3/4-inch thick. Cut the biscuits out with biscuit cutters and place on the prepared baking sheet. Brush lightly with milk or cream and sprinkle with paprika. Makes 10 to 12 biscuits, or more with a smaller biscuit cutter. The key to light, flaky biscuits is in the handling of the dough. Overmixing or kneading too much will make the biscuits dense and hard.